We decided not to have a main tree this year. Call me crazy, but rather than the usual gorgeous but frivolous great smelling fresh cut enormous tree, or any other fancy variation, we decided to simply use what we already had. Somehow, simple felt right for us this year. We have several smaller trees instead, one for each main room of the house. I had plans to have them all decorated by now (since they take so little to decorate!) but it just didn’t happen. I’m kind of glad I’m not all done already though, I’d love for my girls to be here so we can decorate it as a family. Christmas isn’t about me doing everything myself, it is about our family enjoying traditions together. I don’t want to give up all of our traditions in my effort to keep things simple. So, I have only done one tree so far. The rest will happen in the coming week or two. 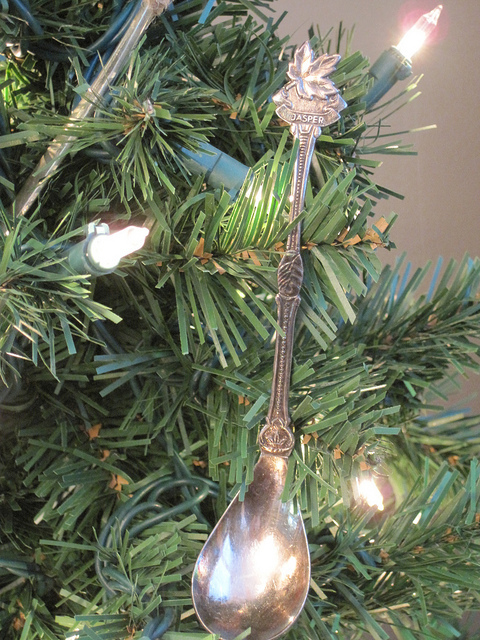 For a bit of quirky fun, I decided to use my mom’s old silver on our dining room tree. The silver is all so beautiful, why not? This is just a random little spoon she collected along the way, but I thought it was cute. It might be adorned with sterling silver, but it is just a simple little tree. Silver tied with jute. Nothing more. Humble. Not proud or fancy or trying to call too much attention to itself. I love it!!! It’s perfect! Very cute. I sent the link to my mom. After spending many many years overseas as a missionary’s wife and having traveled so many places, she has collected quite a few souvenir spoons. I think she should decorate a tree with them! It would tell so many stories. Yes, so true, that is what I love about reusing things that have meaning!! You know I love this. Love love love. My mom does 3 small themed trees and I adore the idea so much! This is just perfect and beautiful. Now that is adorable and so creative Melissa :) you kill me with your amazingNESS woman! This is so beautiful and creative!! The silver is so meaningful! I love it! It IS perfect with just the forks and spoons. It’s a great idea!So pretty. I so admire your commitment to decorate for Christmas this year with what you have. My daughter in law has asked that our gifts to her this Christmas, be donations to organizations that serve the poor. In doing so, I have once again been confronted with how much I have and how little so many people have. Thank you for setting an example of being a good steward of resources! 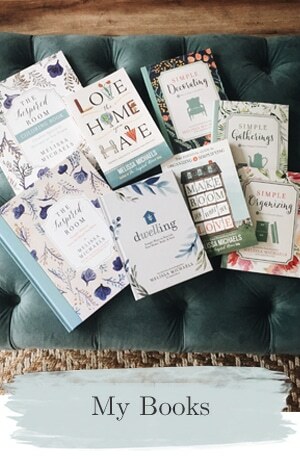 With you, I love to create a beautiful home but doing it in a frugal and creative way is much more satisfying than running out to purchase the lateness in home decor. You do such a good job of reminding me of that. 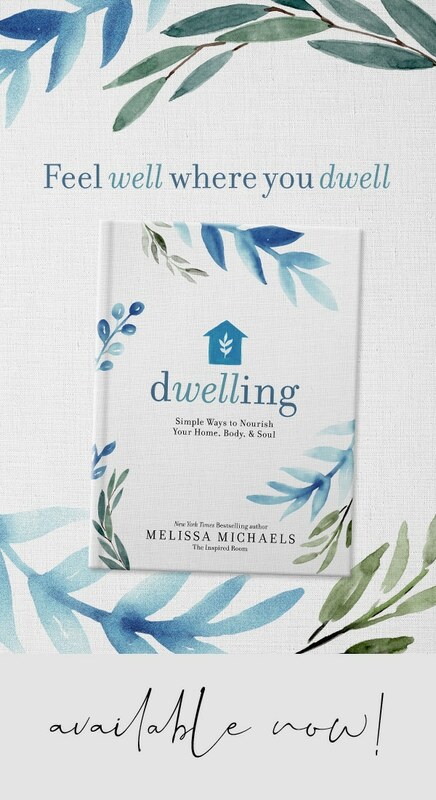 Thank you Melissa, it is hard to see so many people struggling and in need and know that many could plunk down more money on brand new decor for Christmas than they have to their name. Every year I say I’m going to do small trees in every room instead of one “big” tree. I love your dining room tree. Very pretty! I love it! Simply beautiful! Well, now there’s a special little tree. Very original and a great idea. What a fabulous idea…simple, beautiful, meaningful! That is so precious! I can’t wait until we have enough room that I can have more than one Christmas tree up. I have several silver pieces that were my mothers that just sit in a drawer. This is a wonderful idea to use them, even if just once a year! Oh dear, I just love this. I have some of my mom’s antique silver – spoons with gramma’s name or a great aunt’s name engraved on the handle. My bare alpine tree in the dining room would be perfect for this project. Thank you! Beautiful. I’m so encouraged. We just got our tree up last night. We just adopted an older child from oversears this fall and our family life is so crazy right now. Planned to put up the tree last Friday night but I ended up in the ER overnight – final diagnosis, not heart problems but muscle pain – maybe caused by stress. Planned to put the tree up Tuesday night, but had to go to urgent care and get antibiotics. I was feeling like a failure. Finally last night we got the tree up and I’ll continue to add a few simple decorations to our house as we go. So encouraged that you are not all done. Oh, you have been through the ringer! I hope you get some rest! Magnificent! Sometimes my family decorates the holiday birdie cage (a 3ft tall cage without birdies; we put the presents inside the cage). But I just love your silver tree! Very inspiring indeed. What a great idea. I have a chest full of random silverware my mil gave to me that would be perfect for something like that. I love this idea! We are hosting Christmas this year for the first time, so this would be a wonderful way to decorate my dining room for the family; plus a great way to show off family heirloom silver! I love the jute, too! Thank you for getting me started on silver polishing my Gam’s spoons. What a special way to remember my grandmother. 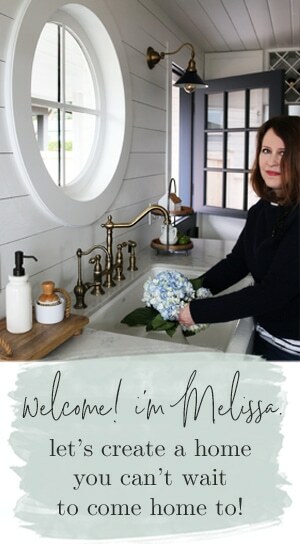 Love your ideas Melissa. Merry Christmas! That is ADORABLE …… I have to have one of my very own!! Thanks for the great idea. Oh my! I do love that tree!!! Thanks for sharing! Hey! you should totally come over to my week long party link-up called “A very Merry Christmas Party” ! Dec. 18-25th! Humble trees are my favorite. 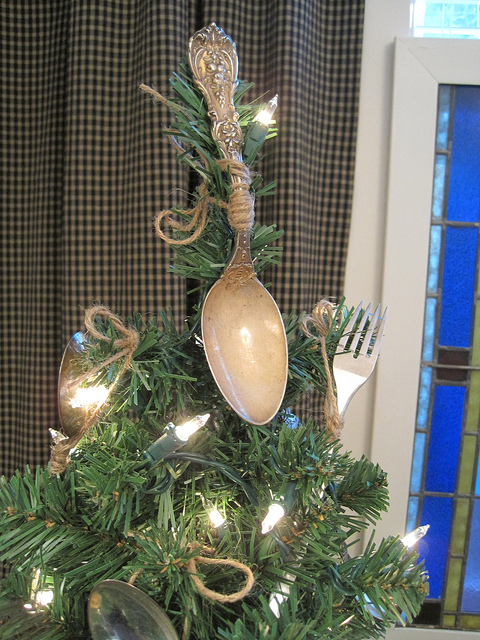 I really like your spoon & fork tree. A simple and clever idea. Love it!! I love it. And in the dining room! Even better. It’s good to do things differently from time to time. Now your little dining room tree is the cutest thing!! I love your little spoons and forks. I may need to do this sometimes. It’s a very sweet little tree!!! I love the silver! I know what you mean Melissa about wanting the girls home…..I’m feeling the same way. Mine should be home next Friday, and I can hardly wait! Would love the candle holders! Just lovely! Loved the dome. I’m always looking for interesting domes and even more interesting things to put under them. Have one on display with a miniature gold framed painting of flowers. Still looking for others things to put under it. I love it! Silver is so unique and quirky. I think, the less they match, the better and more interesting the set. Heirlooms make Christmas so special. We repurposed my grandmas table linens into bows, a tree skirt, and our stockings. They mean so much to us. I just finished blogging about it. 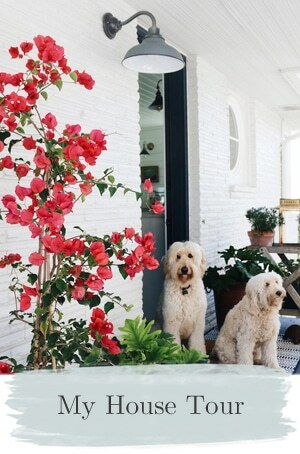 Your decision to go with smaller trees in each of the main rooms of your home sounds like a very practical plan. I’m sure that you and your husband entertain a lot during the Christmas season and this requires space. It must work perfectly. My own experience has been that once the children are grown with their own trees to decorate, they’re much less helpful with mine. Now that handsome son of yours must be a great help! Thanks Vee, I cannot wait to let my son help with the rest of our trees, it is so fun to see kids involved in decorating. It means so much to them! I really love it. It’s green too, and in this economy, I think you’ve made a perfect choice! How fitting for a dining room! I can’t wait to see how you decorate the trees in the other rooms! gonna hang on to that idea!!! That’s the prettiest tree I think I’ve seen. I used to have a small tree in the kitchen decorated with gingerbread men cut out of felt, candy canes and red gingham bows. I loved how simple it was and it was fun to have a kitchen themed tree. Melissa, It is a beautiful tree! I almost hung spoons on my little kitchen tree. Which is the ONLY tree I decorated this year. Like you, I decided to go simple, less and enjoy it all MORE. I have another pre-lit small vine tree on the fireplace hearth. Plus I decorated the mantle. That is it. Just a bit of twinkle and shine with a lot of enjoyment. I love you used your Mom’s silver. So special. What an adorable and clever idea. I really like this! Brilliant! I just don’t have any cool old silverware. Love to hear about you and your daughters. Miss you! Have a fun weekend. This just made me smile- I just put a tree in our cottage dinning room…decorated with my Mothers spoon collection that she got from each state in the USA…so fun. that is the most simple yet adorable tree I have seen this season! Hey, Melissa, it seems that a lot of us are not feeling the BIG tree this year and it feels so good. I may never go back to a big tree again! Love your little tree with the silver, so cute and very festive & I know a lot easier to put together. Who cares if everything is not done yet? Have fun with your family, that truly is what it’s about. Family & being thankful. Merry Christmas, friend! 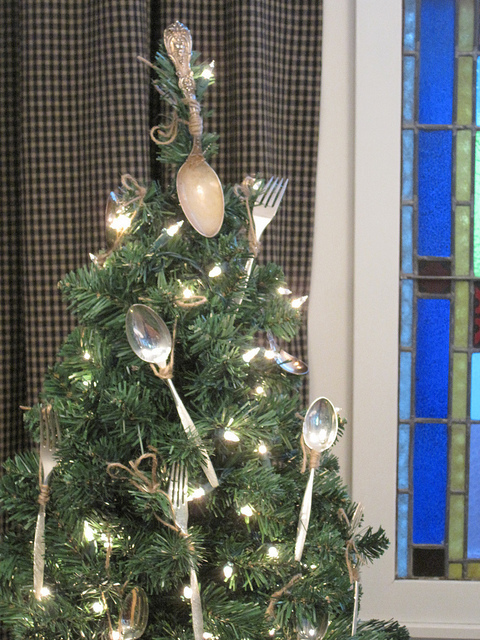 I love the spoons and forks on the tree! What a great idea! Hmmm, think I’ll having to go digging around my siverware drawers for extra pieces. Thanks for sharing this! I am so in love with your tree… My Mother has a house fire back in March. She was fine, the house… not so much… It has all been repaired now and she practically has a beautiful new home. As she was going through all of her belongings, she rediscovered her Grandmother’s ‘silver’ ware… She never uses it and asked if any one in the family would like to have it. No one spoke for it. Until now… I called her after seeing your tree and said if no one else cared that I would love to have my Great Grandmother’s silver and that I had the perfect use for it… Thank you so much for sharing!! My Grandma had a spoon collection. I have no idea where it is these days (my Dad wasn’t very careful with her things after she passed away), but I sure would love to have it. I miss her so much this time of year. PS- I use the word “fun” because she and I would sit and talk about where she got each spoon from when I was little. Such good memories! Love your kitchen tree . we too chose to just use small trees as I have three in my living room , one in our bedroom and now looking at your kitchen tree I may do one there also ..thanks for sharing .. I love the simple live and simple things ! I love this idea!! I have a little tree in my kitchen, sitting there wearing only lights. I wanted to do something kitchen inspired and this is just the ticket! The simplicity is wonderful! Very beautiful… Thanks for the idea! What a great way to display a collection! Thanks for sharing such an original idea. Love it. Really beautiful, sophisticated and fun. Love this idea! I have a small kitchen tree that’s all decorated with little copper teapots and rolling pins, pots and pans that they used to sell at Williams-Sonoma a few years back. Not fussy but so cute. I love the silver spoons idea. So fresh, so simple but really, really beautiful! Blessings! 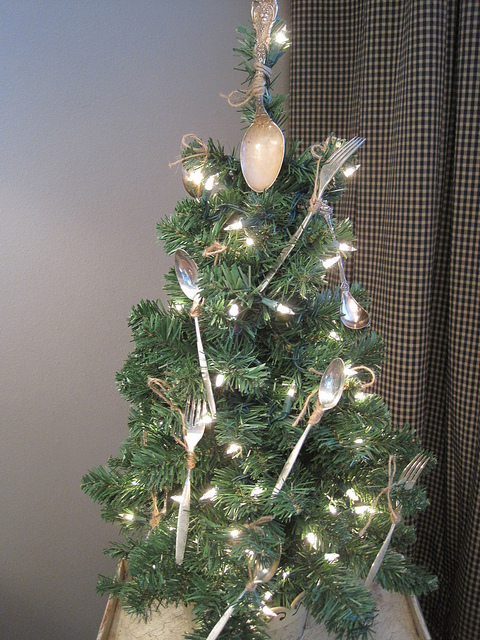 Very neat idea using the silverware on a Christmas tree! It looks so cute! Merry Christmas! I love this! 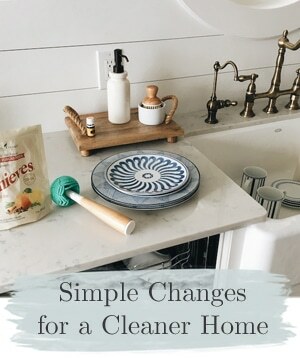 I featured it today on blog Today’s Top 20! I would love if you stopped by! P.S. And if you could click our donate water widget up at the top corner..each click and P&G will donate 1 days worth of clean water. It’s free! Thanks! 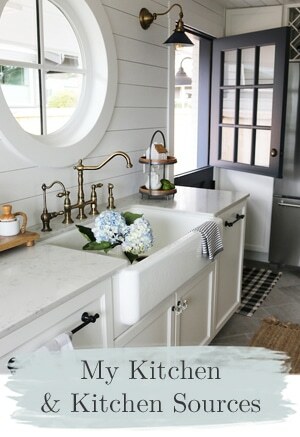 I just love this and am going to do the same in my kitchen. Just need the raffia or twine. So sweet! My mother collected souvenir spoons and when she died, they came to me. Not really my thing, but I ADORE seeing them on my Christmas tree! This reminds me of spoons bunched in a glass or small vase on the kitchen table. My grandma kept her everyday spoons out and I have only seen one other person do that. Seeing them reminds me of those days long ago.